A dwarf barbarian wearing scale armor and carrying a large shield and a waraxe. Gir is tall for a dwarf, around 5'6", and heavily muscled appearing almost as wide as he is tall. His beard is close cut and his head is shaved. 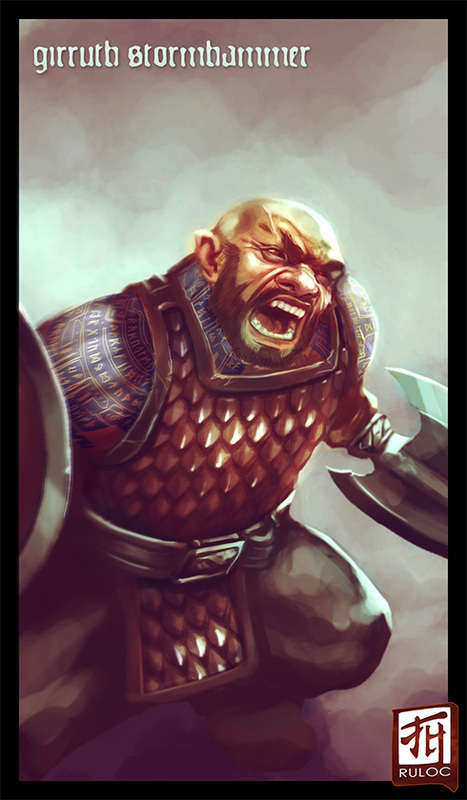 He is heavily tattooed with various dwarven runes on both arms and up the sides of his neck to his jawline. He has a faded scar running across his face from the top of his head, across his right eye, and over his nose to the left corner of his mouth. Numerous scars on his forearms, some partially covered by tattoos and some cutting through other tattoos. Loose pants and heavy boots with steel covered toes cover his lower body. His arms are bare with the exception of a pair of heavily engraved metal bracers and he is wearing a thick golden ring on his left hand engraved with elven script.